Co-ordinates 35.6° N., 139.7° E.
Tokyo, the capital of Japan, is the economic, political, educational and cultural center of Japan, and is situated on the eastern coast of the main island of Honshu. Prior to becoming the capital in 1868, the city was named Edo (江戸, meaning "estuary") and served as the power-base for the Tokugawa Shogunate between 1603 and 1868. Urban parks became an increasingly common feature of European and American cities in the 19th century and elicited the interest of visiting Japanese leaders. The concept of the urban public park was introduced to Japan by the country's new Meiji oligarchs within the context of the radical reshaping of Tokyo. Representative are two sites. The first is a hill in the north of the city with long-standing associations with the Tokugawa shogunate; the second is a parade ground next to the site of the castle-palace. The hill became a park in name but in practice remained a site for public celebration, while the parade ground was transformed with considerable difficulty and over many years into a consciously fashioned recreational space. The two show the contrasts and hesitations that surrounded changing understandings of the role of the capital city and its shifting symbolic landscapes, as well as the gradual process of domestication of the concept of a public park. The Horyuji Homotsukan [Hall of Horyuji Treasures] of the Tokyo National Museum displays items from the Horyuji temple in Nara Prefecture. Meiji officials sought to implement cultural policies modeled on those they had seen in action in Europe in the 1860s. Machida Hisanari (1839-97), "father" of the National Museum, served both these interests and used the collection to promote the restored monarchy. Under Tokugawa rule, a limited number of elite schools taught values of literary civilization to encourage discipline within the class of hereditarily-qualified office holders. Schools were storehouses of texts and patronized scholars, serving as waystations for bureaucratic candidates lacking office and for domainal students. In the Meiji Era, consolidation of the government schools as Tokyo University in 1877 brought a strong emphasis upon introducing new forms of expertise, especially in science and technology. Advanced schools were transformed into centers for academic activities such as research and publication by experts often possessing national reputation. Control over education was delegated to the Ministry of Education, leaving the schools free to concentrate upon developing new forms of expertise. The university was gradually forced onto the stage of national politics. New nationalist epistemologies in the social sciences were introduced, and university scholars began to enter public debate as experts in many areas. The study of law developed rapidly at Tokyo University, making the university the foremost supplier of candidates for bureaucratic office. Thus by the 1880s the university had become an invaluable political instrument to the government bureaucracy. Tokyo, formerly known as Edo, lies on the Kanto plain, which was settled by the 3rd millennium BC. Modern Tokyo still carries some local names of former villages. Hirakawa-mura, a farming and fishing village on the shores of the Hira river, had a strategic location, commanding land, sea, and river routes along the Kanto plain. In the Yamahura period (c. 12th century), Edo Shigenaga, the military governor of a large Kanto province, erected his castle there, calling it Edojuku. The castle was rebuilt in 1456 by Ota Dokan, shrines and temples were established around it, and merchants developed nearby ferry and shipping routes. By 1590, when the shogun leader Tokugawa Ieyasu selected Edo as his military headquarters, the settlement surrounding Edojuku boasted a mere hundred thatch-roofed cottages. Ieyasu assembled warriors and craftsmen, fortified the Edojuku castle with moats and bridges, and built up the town. After 1603, he became the effective ruler of Japan, Edo became a powerful and flourishing city as the effective national capital, though Japan's imperial seat and official capital remained in Kyoto. The Tokugawa political system rested on both feudal and bureaucratic controls, so that Tokyo lacked a unitary administration. The typical urban social order was composed of warriors, peasants, artisans, and businessmen, the latter two classes organized in officially sanctioned guilds whose number increased with trade and population growth. Because businessmen were excluded from government office, they nurtured a culture of entertainment, making Edo a cultural as well as a political and economic center. Edo was one of the world's 10 largest cities in 1800, with a population estimated between 685,000 and 1.25 million in 1800. Edo was a significant force in generating social change and economic growth in Japan during the final two centuries of Tokugawa rule. The city's demand for human and material resources resulted in an appreciable migration of people within Japan, the creation of new markets and marketing patterns, and generated improved standards of performance and new tastes for living better. The city had two type of land ownership bukechi and chochi. Bukechi was used exclusively by members of the samurai class for residential purposes. There was no system of private landownership, no sales or purchases, and therefore no recognized land value. Chochi, on the other hand, was used by ordinary townspeople, both merchants and craftsmen, for both residential and commercial purposes. Private landownership was recognized and chochi land had agreed values. In the 1870s the Meiji reformers put bukechi land under the same rules as chochi land, thereby sweeping all remnants of feudal class divisions. Local government in each Edo district was organized under the two highest officials were the machi bugyó, who drew up and issued administrative orders. Next came three full-time administrators, called toshiyori, who were hereditary office-holders. The nanushi, or headmen, were responsible for up to a dozen machi. After 1720, the nanushi were organized into 20 guilds. The had the difficult challenge of protecting the overcrowded city, built of flimsy wood houses; in 1657 a huge fire razed two thirds of the city, causing 100,000 deaths. Severe sanctions in Edo against those usually known as kawata (derogatorily labeled eta by others) and those labeled hinin (literally "nonhuman") were codified in law and backed by state force. In the city of Edo deliberate political and social processes led to the creation of the Burakumin outcast order in Japan. Even though ideologies of "pollution" and "impurity" may have played a role in determining who was targeted for discrimination, the production of a system of prejudice and intolerance was chiefly the result of deliberate political and economic policies of the ruling class. The Machikaisho of Tokyo was a warehouse for rice storage that was set up during the Kansei reform period, 1787-33, as a way of ruling Tokyo. This granary provided relief for famished city dwellers and low-interest loans to landowners. Important schools were established, such as Shoheiko (1790) for the study of Confucian classics, Kaiseigo (1885) for western learning, and Igakusho (1863) for the study of occidental medicine. In 1877 they merged to form Tokyo University. An attack by imperial troops on Edo followed hard on the defeat of the Tokugawa forces at Toba-Fushimi in January 1868. Edo Castle surrendered in the early spring and the Tokugawa family and retainers were forced by the new regime to depart for Suruga. Edo was renamed Tokyo ["the eastern capital"] and the new Meiji boy emperor arrived in the fall. Bystanders to this political turmoil, the urban poor, caught between rising prices of rice and fish and the downfall of the old bakufu leadership, commented cynically and often humorously on their predicament through newspapers, broadsheets, handbills, and woodblock prints. In the first two decades of the Meiji period (1868-1912) the country's leaders engaged in intense discussions about the future of the capital of Tokyo. The Fifty-Ward System, was part of the effort by the new government to strengthen control over the people. It preserved the Town Official System and the deliberative organ of representatives of Edo, but dissolved the ruling system of the headmen. It soon gave way to the Large and Small Ward System. Some planners argued for the importance of urban beautification, while others regarded changes in urban infrastructure and services as essential to maintenance and growth of the city. Many of the proposed changes were cloaked in the language of progress. Phillips (1996) examines the course taken by urban leaders of the first decades of the Meiji period in establishing planning policy, using planning documents, transcripts of planning committees, and on architectural and urban design data from completed urban improvement projects in Meiji Tokyo. Phillips (1996) focuses on two issues, (1) the extent to which the efforts of Japanese leaders focused the country on the goal of modernization, and (2) the extent to which efforts to achieve bunmei kaika, or cultural enlightenment, were superficial. He demonstrates how the concepts of modernity and the struggle to develop a modern urban structure altered previous notions of cities and city planning practices. Poor articulation of planning policy in the first decades of the Meiji period reflected a lack of consensus among Meiji leaders about the definition and course of modernization. Rather than reject traditional approaches to planning, urban leaders eventually incorporated these approaches into their new planning methodologies. Modernity in the Japanese context, consequently, did not require dismantling preexisting urban structures. Instead, it represented a marriage of the political motivations of the country's leaders with the modern urban needs for improved transportation networks and zoning mechanisms. Exposure of the political system to popular opinion entailed the shifting of planning discourse from the theoretical to the practical realm, as well as from the private to the public realm. Ar noon on Saturday 1 September 1923, the eathquake hit, registering 8.3 on the Richter scale. The epicentre was in Sagami Bay, about 80 km south of Tokyo. The earthquake was followed five minutes later by a huge tsunami, with a height of about 12 meters. As fires swept across the city, 75% of all buildings suffered severe structural damage. The quake cut most of the water mains. About 100,000 people were killed from an urban population of about 4.5 million. Some 40,000 refugees died in one location at the Honjo Military Clothing Depot on the banks of the Sumida River. They were huddling together in the building as the cyclone of superheated air passed overhead and sucked out their air so that they died instantly of suffocation. Property damage came to two per cent of Japan's total national wealth. Two million people were homeless. Angry Tokyoans took revenge on resident Koreans, killing hundreds, perhaps thousands. Animosity toward Koreans was fueled by rumors of Korean wrongdoing after the quake. Some non-Koreans were murdered as well, but Koreans became the specific targets because of their distinct Korean identity, rather than simply because they were not Japanese. The Japanese colonial occupation of Korea provided the backdrop to this extreme example of the explosion of racial prejudice into violence, based on a history of antagonism. To be a Korean in 1923 Japan was to be not only despised, but also threatened and potentially killed. In contrast to London, where typhoid fever had been steadily declining since the 1870s, the decline in Tokyo did not begin until the late 1920s in Japan. Within the city of Tokyo, the rate of typhoid morbidity was higher in the upper-class residential northern and western districts than in the densely populated working-class eastern district. An explanation is the decline of waste disposal, which became particularly serious in the northern and western districts when traditional methods of waste disposal collapsed due to urbanization. The great Kanto earthquake (1923) had a major long-term impact on the city's rate of typhoid morbidity. Although the level of morbidity rose to a record high due to unsanitary conditions following the earthquake, it prompted the establishment of antityphoid measures and the building of urban infrastructure. n the rebuilding process, the one- and two-story wood structures were replaced by modern five- and six-story buildings of concrete and steel in the European style. Motorways were built. The first underground subway system opened in 1927 and a new airport in 1931. At 6.36 million, the city's population in 1935 was larger than before the earthquake; it was nearly as large as London or New York. The "secondary centers" or "satellite cities" of Shinjuku, Shibuya, and Ikebukuro grew rapidly. They and the entire surrounding Tokyo prefecture was incorporated into the city in 1943. As a major wartime metropolis. The experience of everyday life in Tokyo dramatically changed with munitions-based heavy industrialization and the loss of liberties and urban culture as the state mobilized for total war. The sensitive issue of how to defend the capital from air attack then became a pressing concern for urban planners, government officials, and even fiction writers. While the government assigned Tokyoites the responsibility of protecting the Imperial capital, devastating American fire bombing raids revealed in an instant the impossibility of carrying out such a task. Tokyo was bombed repeatedly. LeMay sent 325 B-29s over Tokyo on March 9–10 to drop 1665 tons of incendiaries. An unstoppable fire storm burned out 16 square miles and killed over 80,000, most of whom suffocated in bomb shelters when the firestorm consumed the oxygen. One fourth of the buildings in the entire city were destroyed. Half the 7.4 million residents fled to the countryside (which was not bombed). The raid marked a turning point in the American strategic air war against Japan. Previously, most raids were "precision" raids that used high explosives against industrial targets; thereafter, most raids were "area" raids that used incendiary bombs to burn Japanese cities and kill civilians. The strategic shift did not depart radically from the air war in Europe or from prewar planning. Headquarters had always intended for Curtis LeMay to lead the air campaign against Japan and had always viewed incendiary raids against cities and American policy since the 1930s had focused on the burning of Tokyon—and the killing of civilian war workers—as a way to destroy an enemy's industrial capability. After a long interval of silence, private memories of the catastrophic fire bombings became public when air raid survivors and others joined together to write a history of the raids and then attempt to build a museum from which to transmit the experience of war. The destroyed metropolis became the base from which the United States under Douglas MacArthur administered Japan for several years. During this period there emerged two Tokyos. In one, the occupiers appropriated and transformed key sections of the city in ways that allowed them to partake in the spoils of war and live in luxury. In the other, Tokyoites struggled to stave off starvation and to secure housing and employment. The population reached ten million in 1964 as the Summer Olympic Games that year left a deep impact on the national identity of Japan. The nation's wounded psyche and reputation from World War II was significantly healed. Rapid social changes, thematically staged in the Olympic ceremonies, enabled Japan to display an inclusive and comprehensive national pride, and underscored Japan's re-entry into the circle of developed industrial countries. The 1964 ancient arts exhibition put on by the Tokyo National Museum to coincide with the Tokyo Olympics provided an opportunity to promote Japan's traditional culture to foreign visitors and to the Japanese people themselves, as part of an effort to regain normalized status in the international community. Architect Tange Kenzo is most famous for the National Indoor Stadium, built in 1964 for the Olympics. The vast majority of large companies, financial institutions, and government agencies continue to maintain their headquarters in the old center of the city, mainly in the Marunouchi area in the Chiyoda Ward. During the second half of the 1980s, Tokyo experienced a huge increase of urban land prices. This "land bubble" phenomenon led to new strategies in the urban development process. In order to preserve the profitability of real estate schemes, developers used several means of action to increase building density, namely the jiage system and urban renewal procedure. They also experimented with new methods to avoid land purchase, such as land deposit and short-term lease contracts. These new methods of development had a great impact on Tokyo's morphology. Skyscrapers and high-rise buildings were built in business zones instead of narrow "pencil buildings"; huge department stores surrounded by public squares flourished in the vicinity of middle-range railway stations; and modern concrete buildings progressively replaced old wooden houses within residential zones. However, this modernization process was not closely controlled by the public authorities, and it produced an anarchic collection of high-rise buildings throughout the capital city that increased road traffic and worsened parking problems. In early-21st-century Tokyo, the construction of luxury residential and commercial towers in neighborhoods along the Sumida River has accelerated dramatically, altering the social composition and cultural images associated with downtown Tokyo. The new buildings stand in contrast to the sinking economy and are markers of the growing gap between rich and poor. They also reflect the pattern of urban construction and destruction as well as the unobtainable desires promised by commodity capitalism. The Japanese media have featured articles on the escalation of youth crime and discontent, as well as the many forms of corruption that teenagers are exposed to in transformed downtown Tokyo. The 2002 Naoki literary prize was awarded to a book that reacts to both urban development and the problems facing Tokyo adolescents - Ishida Ira's 4-Teen (2002). Ishida shows the effects of Tokyo's transformations on teenage social norms and uses descriptions of urban places to reveal contradictions embedded in these roles. This article examines the context of 4-Teen's publication and the awarding of the Naoki Prize and explores how stories that mix fiction and historical experience provide new ways of viewing the changes in Tokyo. Fowler, Edward. San’ya Blues: Laboring Life in Contemporary Tokyo. ( 1996) ISBN 0801485703. Sassen, Saskia. The Global City: New York, London, Tokyo.(1991). 397 pp. Cybriwsky, Roman. 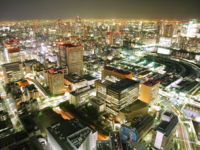 Tokyo: The Shogun's City at the Twenty-first Century. (1998). 260 pp. Raz, Aviad E. Riding the Black Ship: Japan and Tokyo Disneyland. (1999). 240 pp. ↑ Gilbert Rozman, "Edo's Importance in the Changing Tokugawa Society." Journal of Japanese Studies 1974 1(1): 91-112. ↑ Estimates of deaths vary widely, from 70,000 to 140,000. This page was last modified on 9 April 2019, at 18:09.